When online sellers outsource order fulfillment, it ultimately means that they lose some control over their fulfillment operations. It also means that they are putting a great deal of trust in another company, one that can contribute to the seller gaining repeat customers, or even losing customers. At eFulfillment Service (EFS), we understand this. We’ve been doing order fulfillment a long time, and we know that we serve as a critical extension of our clients’ businesses. That’s why, since day one, we have always tried to be as transparent as possible in all that we do. So, as part of that ongoing mission, I thought it’d be helpful to give you a behind-the-scenes look at the order fulfillment process here at EFS, starting with…. For new clients, the first thing that happens is they set up their account within our order fulfillment software. I know, the word “software” can be a little intimidating. But don’t worry, our proprietary, web-based software is simple, easy to use, and our clients have dedicated account managers that walk them through the process. Within our online system, our clients can customize things like…..the message that goes on their packing slips, the message that goes on tracking emails (which we automatically send to our clients and their customers), what types of notifications our clients want to receive, who should receive those notifications at their company, and when we should alert our clients that they have low inventory. Our technology, which keeps both our clients and their customers up-to-date, is one of the reasons why so many online sellers from around choose EFS as their order fulfillment provider. And, as our client, setting it up to your liking is the first step in the process. Next, we work on integration with your cart. Our software not only allows our clients to check inventory and orders at any time, it makes their lives easier and saves them time by integrating with their shopping carts. We’re currently integrated with over 30 of the most popular shopping carts and platforms. With our in-house IT group, we’re always adding more to the list, and we’re also able to do custom integrations for our clients. With each integration, we’re able to automatically pull our clients’ orders into our system from their shopping cart. Our clients can just sit back, have a cool beverage, and watch the orders flow. With some integrations, we’re also able to push inventory and tracking data back to the shopping cart. For carts we’re already integrated with, the process is quick and easy, with no need for any custom development work. Once the integration is complete, it’s time to send us some stuff. With hundreds of clients scattered across the globe, we receive inventory from all over the world. Most online sellers choose to send us inventory directly from their suppliers. For those that are outsourcing their order fulfillment for the first time, they often send us what they have left on hand at their facility. When sending us inventory, an important part of the process is making sure it is as well-organized as possible, with like SKUs packed together, and that it includes a packing slip. If your items don’t have labels on them….no problem….we can do that for you. As our receiving department gets new inventory, they will weigh it, measure it, inspect it, count it, then stock it. Within our online system, our clients are then able to see when inventory has been received and is ready for shipping. Now let’s get some orders! We can receive our clients’ orders one of three ways….via manual entry, importing an order file, or through direct integration with their shopping cart. Within our online system, our clients can place orders any time, from anywhere in the world with an internet connection. Manual order entry is used when we’re not integrated with our client’s shopping cart, or when sellers are placing a larger order that may include special needs or instructions. Sellers can also import a CSV order file into our system, which generally contains multiple orders. This order submission method is used by many of our clients to place continuity orders associated with a subscriber list, which, for example, is common with nutraceutical fulfillment. We’ve already discussed shopping cart integration above, and direct shopping cart integration is the most common way that we receive orders. But, we try to make it convenient for our clients by giving them multiple options for order submission. As we receive new client orders into our system, we check to make sure the SKUs and delivery methods match up, which is the first quality control check as part of our order fulfillment process. If everything doesn’t match up properly, we notify our clients. When things do match up, and most of the time they do, we then adjust the inventory automatically as the order hits our system, and next comes the actual processing. New orders are processed at our facility multiple times per day. The first step is printing pick sheets. Pick sheets contain multiple orders and direct our picking crew where to locate the different items for those orders within our facility. As items are picked, they are toted to pack stations. Most orders are packed in one of our free jiffy mailers or cardboard boxes, which are made mostly of recycled material. Our clients also have the option to use their own branded packaging materials. Items are carefully packed together and a packing slip is inserted which lists the contents of the package. And again, that packing slip can be customized by our clients to have a thank you message, or to provide answers to common questions, such as what to do if the customer wants to return an item. 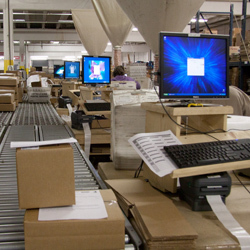 Once orders are packed, they then move down the line to shipping stations where they are weighed. At EFS, we use multiple shipping carriers, so with each order, we are able to rate shop multiple carriers for our clients in order to determine the most cost effective ship option. At the same time, we perform an address verification for the recipient, and packages are then palletized for outbound shipping. Throughout the order fulfillment process, there are multiple quality control checks, which, combined with our technology, is partly why we maintain an industry-leading accuracy rate. The final step is closing out the orders and getting tracking data to our clients and their end customers. As orders are shipped out, they are marked as “completed” within our online system for our clients to easily see. At the end of each day, our system will automatically send tracking emails for orders that have gone out that day, which can be customized by our clients, appear as if they’re coming from our clients, and are also optional, meaning that our clients can choose to turn them off if their shopping cart already sends tracking numbers. In addition to filling orders from our client’s own web stores, our fulfillment technology also integrates with different marketplaces so we work with numerous Amazon and eBay sellers. Our system will quickly send tracking data back to their Amazon and eBay stores once orders have been fulfilled, helping to ensure our clients maintain a good seller rating on these major marketplaces. We also handle returned orders from our clients’ customers. When we receive a returned order, we notify our client, and then follow the returns processing instructions provided by our client during the account setup process. This may involve simply inspecting the item(s) and returning to stock if it is unopened and undamaged, or we may await specific instructions from our clients in other circumstances. If items are returned to stock, inventory is then adjusted within our online system. At eFulfillment Service, the order fulfillment process that we follow is one that we’ve spent over a dozen years developing. And while there is always room for improvement, our many years of experience is what gives our clients the confidence to hand over such an important part of their growing businesses. If you’d like to learn more about EFS and how we work, including getting a quote for our warehousing and fulfillment services, we’d love to hear from you. Take a behind-the-scenes look at the order fulfillment process at eFulfillment Service, from cart integration, to receiving, processing and shipping orders. Just wanted to check if you guys need to be integrated to the ecommerce site? Our process is just simple — we send you the inventory, we email the orders and you ship them. Not sure if you can do that kind of fulfillment. Thanks! I hope this helps! And thank you for your interest in our order fulfillment services!